It certainly hasn't taken us that long to return to La Luna. 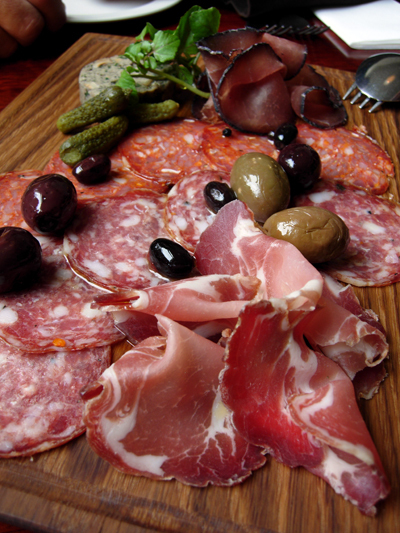 We decide to share a platter of La Luna's very own cured meats having enjoyed them during the Suckling Pig dinner. Once again there is Coppa Collo, Hot and Mild Salami, Bresaola and a disc of hazelnut studded terrine. 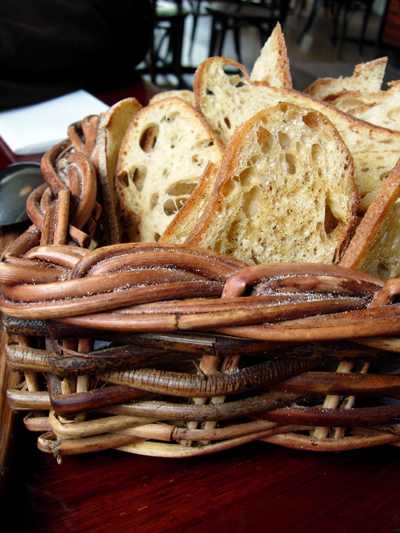 It's served with a large basket of both crispy and fresh bread. To drink: Paalo tried the Moo Pale Ale from Tasmania's Moorilla Estate and I had a glass of Prosecco. As an englishman, Paalo does love a good sausage and he just loved the sausages offered during the Suckling Pig dinner. That he choose this dish was a no-brainer. 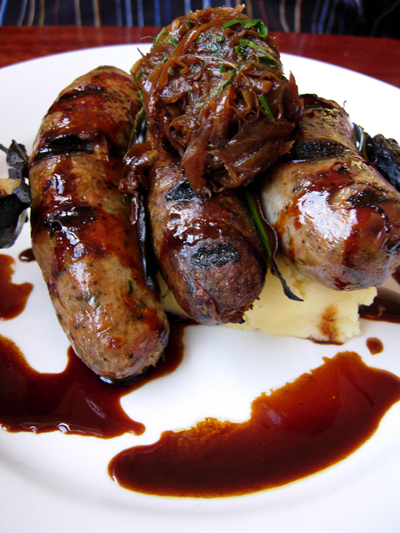 On the skewer sat a pork and fennel sausage, a beef and chilli sausage and a veal and mushroom sausage. What Paalo especially liked were their rough texture, they hadn't been minced to some unidentifiable mush - there's substance to these sausages. 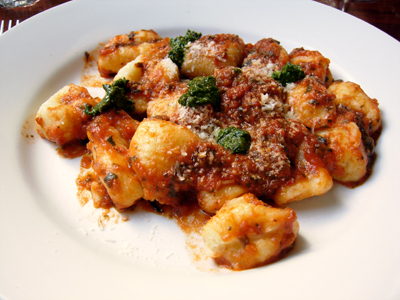 It's most unusual for me to order Gnocchi but based on the food that's come out of La Luna's kitchen I should get something authentic. My reluctance is based on the generally abysmal way they have been made here in Australia - they are abominations made with tonnes of flour and come out in sizes that rival a child's fist and require a knife to cut into them - they are everything that gnocchi are not supposed to be. Having grown up with a Mother who makes them as light as a feather and experienced their true taste, anything short on that standard is a failure. Now, I would say that these gnocchi were a little on the large size for my tastes but in comparison to others out there, they were more than reasonable. Tastewise was predominately potato but I'd say that egg was used in the dough. It's a hearty dish. To go with our mains we both opted for a glass of the 2005 Sorrenberg Gamay. At the suckling pig dinner, Paalo missed out on tasting the creme brulee so he happily made up for that. 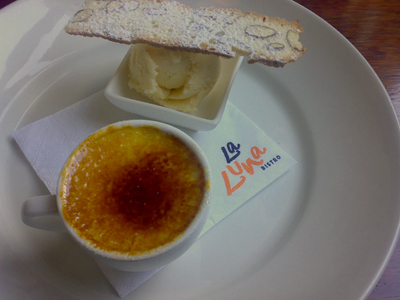 This lead to a discussion about his preferred "creme to brulee" ratio and he decided he liked this type of presentation - a thin topping over a thick layer of creme. The ice-cream was excellent, also made in-house with a fantastic speckled appearance. I don't know but when vanilla ice-cream is done well it really can't be beaten.